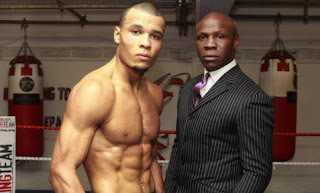 Eubank Jr - A step down? In just under a month’s time, Britain’s much talked about Middleweight prospect Chris Eubank Jr will step back in the ring against the current British Middleweight Champion Nick Blackwell. This will be Blackwell’s third defence of the crown, and a win would make sure he secures this coveted prize when he leaves the ring. The question many people are asking however is, why has Eubank Jr taken a step backwards to go after the British belt, when his recent success had him closer to a world title belt. At yesterday’s press conference, Eubank Jr hadn’t really provided onlookers with a definitive stance on this question, however did state that the British Middleweight title was something he wanted before he went for a world title. As much as I respect his decision here, I can’t help but think had a potential showdown which enabled him to take a step closer to a world title been offered, he most probably would have taken it. With that being said, this should be a highly entertaining fight and one that both fighters will take something away from. After his loss to Billy Joe Saunders, Eubank took a step back and began the rebuilding process, acknowledging that this just wasn’t the right time in his career to be fighting for a world title. With subsequent wins over Dimtry Chudinov and Tony Jeter, he got himself back in a position of confidence to take another step up in opponent quality. That fight saw him fight on the Joshua v Whyte undercard against Irelands Gary ‘Spike’ O’Sullivan, where after a slow start, he gradually picked apart his opponent forcing O’Sullivan to throw in the towel at the end of round 7. Although continuing to divide opinion, this performance had again shown fans that he had the ability to fight at a high level. Venezuela’s 12-0 Alfonso Blanco was an obvious choice, the current holder of the Middleweight interim belt, however nothing developed here, and the decision was made to go after the British Crown. In light of Eubanks previous performances, this is certainly a step down for him, however one that I am somewhat pleased to see. Many Boxers get criticized for taking big pay day fights and climbing the rankings undeservedly, and although this seemed like the initial route Eubank Jr was taking, a loss to Saunders and undoubtedly humbled him. Whether he then decides to defend the crown (should he get the win) is another matter, as im sure the other middleweight prospects around the world will come knocking, but for now it’s refreshing to see someone take a step back to make sure any unfinished business at domestic level is settled. Eubank Jr goes into this fight the clear favourite and just like many other critics, I feel a middle to late round knockout is likely. Blackwell seemed to peek in May of last year when he picked up the win over John Ryder, however with the 2 fights he rounded the year off with, he demonstrated very little and Eubank Jr will not be worrying over any potential floors in his game plan any time soon. There is clearly further reasoning behind this decision, notably contractual issues with Eddie Hearn’s Matchroom. In what seemed to be an obvious decision between the 2 camps, things clearly weren’t right for the men from Brighton as they decided to pave their own way to the top. To be clear Eubank Jr will not be leaving the ring on March 26th with any change in opinion, the love – hate relationship the fans have with him will remain, and he will have to do more than win a British title to get more people on board. But for now, and whatever the reason, I have admiration for Eubank for taking this fight, and hope the feud already created between these two men, builds to a great fight on March 26th. The long awaited Super Bantemweight showdown is just hours away, and although this fight may not be the hottest ticket around the rest of Europe or across the pond, rest assured this is Britain's biggest grudge match since Froch v Groves. This matchup has been a good few years in the making, and finally we will get to see all the answers to all questions haunting these men since they both reached championship heights. Interestingly both men have divided opinion straight down the middle, leaving fans batting back and fourth with who they believe will come out on top. 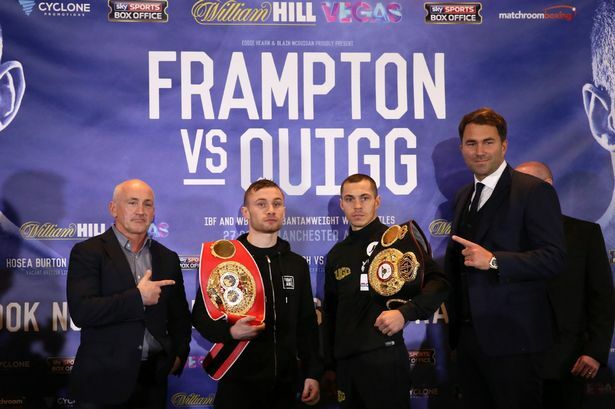 'Quigg is the better all round Boxer', 'yes but Frampton has the knock out power'. These are the type of things you have undoubtedly had to listen to since this fight was first announced. I believe both statements carry truth and could eventually decide the outcome of this unification bout. Scott Quigg the local man proved in his last outing that he has everything it takes to turn up the heat when nessesary , forcing the referee to step in and stop further damage to veteran Kiko Martinez. A man Frampton struggled to dispatch in the same fashion. Many fans believe this is the best measure for both men. Frampton has however got through contests with Avalos and Gonzalez Jr, albeit with knockdowns. Quigg will come in the bigger man, only slightly due to the 10lb weight gain limit, but he is naturally bigger and will surely carry the weight better. With this in mind I do think the Irish man will not be phased by this and will distribute as much punching power regardless. Another key factor remains general in ring prowess and experience, something Frampton has been very vocal about, telling Quigg that it will be his 'Boxing brain' that will let him down. I don't believe this for one second, but again both men have proved they have Boxing ability in abundance and when deeper into the fight something that will become increasingly clearer. Fanbase initially played a large factor in this contest, with most people believing the Irish man will bring across his ever growing home crowd and having them out do the noise brought by the local fans from Manchester. (Don't forget Irish blood runs deep in to the Mancunian people as well). However the weigh in proved that things seem pretty even, with Frampton receiving his first taste of boos and jeers by the arousing local fan boys. There are other things to consider when soaking up the build up to this fight. From Shane Mcguigan's verbal onslaught of Ring magazines number one trainer Joe Gallagher. To Eddie Hearn's need to prove his decision to bring Quigg into the Match room stable, was just as justified as letting Frampton go. Barry Mcguigan has also started the mind games, by voicing opinions over the dressing rooms. Everything factors in to making this one of the most eagerly awaiting bouts in recent history and just the third British world title unification fight in 23 years. When weighing up all attributes and floors, I do feel Frampton will prevail. Let it be said this fight will not end early and will most probably hit the later rounds. I personally feel Frampton will sway judges over the full 12 rounds. I think he has a little more to offer in terms of fighting on both the front and back foot. His punching power is proven, and his experience from an incredible amateur career to date, should be enough to keep Quigg at distance allowing him to score marks from the judges. I further know there will be moments when Frampton steps in and tries to land that KO punch, however I think he has enough respect for Quiggs ability to not get caught up in those exchanges. Whatever the outcome, I can not wait to finally find out who takes away the IBF and WBA Super Bantemweight belts, and finally give fans the answer they have been asking for so long. I'm reading so many articles, gossip columns, tweets and so on about Kazakhstan's 34-0 punching machine Gennady Golovkin and what he would do in a super fight with Floyd Mayweather. 'He would walk through him', 'destroy him', 'Golovkin would knockout Floyd' these are just a few of the type of things you can expect to hear when this subject is hot topic of conversation. To make one thing clear, the 49-0 one time P4P champ, has already clarified his intentions by stating that he would not be able to step up to Golovkins weight, however Golovkin has confirmed he would step down should the fight ever happen. So in true Boxing fashion, we can only right now make the best of a hypothetical situation. With that being said, that's not to say that the 'money' man won't some day grace the ring one last time for a showdown with Golovkin, and if he does I am more than confident Floyd would win....comfortably. I understand why fight fans have a genuine buzz for GGG, he's hit the Boxing scene with a bang, literally. Making full use of his punching power and ability to walk through shots to gain an advantage over his opponents. He's exciting, with a scene of vulnerability until he steps between the ropes. He smiles when at press conferences or in interviews, these are the atributes that build up one of Boxing's most loved characters right now. 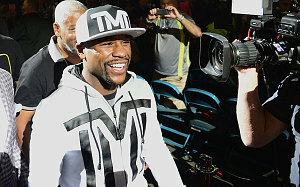 Mayweather on the other hand, does not punch hard, avoids walking through punches, exudes confidence at any given opportunity and became one of Boxing's villans for doing so. However these are Floyds atributes, and these amongst other skills packed in his arsenal, are the reason he would have no problem beating the current Middleweight king. Mayweather's record stands for itself, and as much as people won't want to admit it, it's a record that will stand up against those of the best. Remaining unbeaten has the likes of Joe Calzaghe and Rocky Marciano firmly cemented in Boxing's history, as will the 'pretty boys' record. Only I can't help but think people won't recognise it until the name Floyd Mayweather becomes a thing of the past. It's not only his record, but the array of different fighting styles he overcame along the way. Throw Pacquiao, Alvarez, Maidana, Cotto and the rest of these great names into the mix and you could most definitely mould a Gennady Golovkin type fighter. The problem for Golovkin is Mayweather has always found a way of beating these men. Taking away power, slowing them down, slipping each punch and genuinely spoiling fights where nessesary. Yes he has done his fair share of 'running', but as unpleasant as it is to watch, that continuous running has gifted him numerous world titles across numerous weight classes, a place in Boxing folklore and $900M worth of assets. Golovkin also remains unbeaten, however I have seen very little that suggests he would make easy work of Mayweather. I don't deny his ability, I also can not accuse him of not being entertaining, however I can say that if they did meet, walking through punches won't work, trying to land that power punch won't work and trying to defend himself from being hit won't work. No matter what he has shown so far in to his career, it's not enough to convince me that he can beat one of the best fighters to ever get in the ring. Watch back the fights, analyse the craftsmanship and the opponent in hand, and I'm sure you will acknowledge my argument. I am aware this will undoubtedly cue and orchestra of fan boy chants, however the proof has been written across a decade of defending world titles. I guess we will have to wait to see if the fight ever happens, or we can measure GGG's success over 12 rounds with Alvarez. Khan - When in Vegas...gamble. I initially want to make one thing clear, I'm a British fight fan, always have been always will be. Unless for some unknown reason the BBBC decide to erase the professional sport from UK soil, no disrepect to the Cubans here. The reason I want to make this clear, is articles like this usually result in a turf war like tyraid of comments instead of a gentleman's discussion over the hot topic raised. 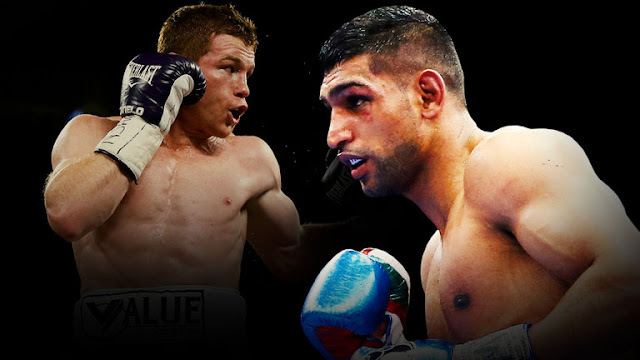 What hotter right now than the recent anounncement of Amir Khan's decision to step up in weight and fight 46-1 Mexican Saul 'Canelo' Alvarez. A decision that has many fans scratching their pugilist brains trying to understand why Khan would take what many feel to be an impossible fight. Well let's ask ourselves a few questions that currently stand in the way of fans getting behind the young man from Bolton England. Does Kahn deserve the fight?. In short, yes. 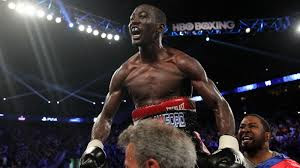 Of course he deserves the fight, previous matchups against the likes of Maglinaggi, Maidana, Peterson, Garcia, Alexander and Algeri, means the 31-3 fighter has got himself into a unique position where he can not be overlooked. This is still dispute his loss to 2 of the fighters mentioned above. Clearly there are other fighters in the division that by way of fights deserve this opportunity, however these men have not stepped forward to make this known. Khan on the other hand has made his intentions very clear. Is it about the money?. Of course it's about the money, what fight isn't about the money. Ask any professional fighter on the planet and they will tell you the same thing. If not for the money, then for a title opportunity. Either way a nice pay day does not go a miss when these guys step in the ring. Eddie Hearn recently confirmed that he offered Kahn a very respectful purse bid to fight UK rival Kell Brook, but khan was very quick to dismiss that the fight was turned down due to money, and more down to the fact, Brook did not deserve this fight. Can Kahn beat Alvarez?. No. And I do not say this lightly. Amir has all the ability in the world, proven with his masterclass over Devon Alexander in December of 2014. Everyone is aware of Khan's speed, it's his biggest assets and something that has allowed him to climb to world title competition. His movement, experience and will to box on the front foot, remain the biggest reasons many will tune in to watch him fight. However, what Kahn posecess in attack, he severely lacks in defence. Virgil Hunter made his views consistently clear everytime Khan went into a training camp. Defence, defence, defence, much of which was based around a Mixed Martial Arts blueprint. And so far this seems to have worked, however nothing prepares Khan for the type of slipping, blocking, footwork and counterpunching that he is going to have to find when stepping into the new TMOBILE arena in 3 months time. Note: I have purposely avoided addressing the weak chin that reluctantly, paves the way for much of Amir's career and critics. I am a Khan fan. Hard to believe I'm sure, especially after what I have mentioned above. However Saul Alvarez is not only one of the biggest and strongest men in Welterweight / Middleweight boxing, he has ample experience, much he would of gained from his encounter with Floyd Mayweather and Miguel Cotto. The type of experience, Khan is about to gain. This isn't about, who deserves what fight and who earns what money against what opponent. This is Boxing, a sport that separates fans and devides opinion. I'm sure some of you will agree with me, however I'm sure there's many of you that don't. And it's you fans that will make Khan feel on top of the world if by some minor miracle, he comes out of this fight with a W. But hey....when in Vegas. Shocked. The words uttered on most peoples lips when last week the news broke that Britain’s Anthony Joshua would take a leap of faith into the unknown, a shot a America’s IBF champion Charles Martin. This reaction was expected, and I think both fighters understand why fans have become slightly unnerved by the announcement. Let’s make one thing clear, this was not a knee jerk reaction from either fighter, both have unbeaten records that they aim to protect. Martin has only had the privilege of calling himself the IBF champion for 1 month now, and Joshua has had no major experience at top level competition. It begs the question, why now? Well for both fighters it seems pretty simple, Joshua wants a world title (that’s why you continue to fight right? ), and Martin presumably had quite the handsome financial offer from Eddie Hearn’s Matchroom promotions. So the fighters seem very comfortable with their decisions, however the fight fans are not so sure. American fight fans make no effort in hiding their feelings for an American Heavyweight Champion, especially after a decade of dominance by you know who. And the feeling of uncertainty has started to creep in knowing that Martin’s first defence is against a 2 time ABA champion, and a man who many have tipped to be ‘the next big thing’ in Heavyweight Boxing. I can’t help but have flashbacks to Darren Barkers climb to the top, after beating Daniel Geale, decided to make his first world title defence against Felix Sturm. Not the best decision in most people’s eyes. Perhaps the American pugilists are satisfied in the knowledge that should Martin lose, they still have another champion in the shape of WBC title holder, Deonty Wilder. Either way, it has certainly left people questioning……how much has Martin been offered to take this fight. UK fans are much of the same thought process, however money isn’t an issue here. The first question is can Joshua actually win? Well the general feeling is yes, yes he can. His competition has been tougher in his rise to a 15-0 record and he has a very strong amateur background. However the second question is can he retain the belt? Vyacheslav Glazkov, the Ukrainian who came so close to his dream of winning a world title, if it not for his unfortunate leg injury, will be the first name in the hat. And then the likes of Teper, Cunningham, Pulev and Stiverne, will all come knocking. And this is purely based on IBF rankings, many of these guys have already had a taste of world level Boxing and know what it takes to fight at this level. Furthermore, no matter the outcome of the anticipated Fury v Klitschko rematch, one of these guys will undoubtedly want a shot at Joshua. I guess the old age expression, ‘time will tell’ is quite fitting here. However I still ask myself, why now? OK, so I want to set the record straight regarding the recent Amir Khan and Floyd Mayweather saga. I acknowledge from many fans their shock to Mayweather having the audacity to turn down a fight with Khan and then have him added to his upcoming fight card with Marcos Maidana. Khan who seemed to have won one of many online polls to have a match lined up with Mayweather had to take the back seat after Mayweather confirmed he was after Maidana instead, this left a very bitter taste in many fight fans mouths, notably UK fight fans. However, these are the same fans that have criticized Mayweather for taking easier fights and taking an easy route to see out his career. I cant understand peoples frustration with Mayweathers choice of fight here, I understand that Khan has beaten Maidana and on paper, should be the rightful man to step in the ring, but at this point in both mens careers, I think we can all agree that Maidana will offer more problems for Mayweather than Khan will. Amir Khan took to Sky Sports Ringside show to confirm that Mayweather actually rang him directly and explained his reasoning here. Confirming that he has 3 fights left on his showtime contract, Mayweather has promised Khan a fight dependant on the upcoming results of their match ups. Realistically the only thing Mayweather has lost out on here is revenue, opting to take the Maidana fight over Khan will probably lose him a considerable amount of money as the American public love to see the quick, flash and exciting ring presence of Khan. Adding Khan to the undercard will of course bring up the ratings and money, with Luis Collazo on the opposing corner this will act as a co-headline to Maywethers fight. This fight in itself doesn't have the appeal that I would have liked, Robert Gurrero would have been the better option, but Khan knows he is going to have to shake off some ring rust and this is the right route to do so. My Final thought leaves me thinking what more can Floyd Mayweather do to please the fighting public, the Pacquiao days are over, people must begin to accept that he must take on other fighters, fighters who have earned their shot. In my eyes Maidana has earned his shot over Khan. Heavyweight contender Dereck Chisora has already started his verbal attack on the man he will be stepping in the ring with on July 26th Tyson Fury. Chisora confirming that even though Fury will be fighting infront of his home crowd in Manchester, the local fans wont be getting behind him as they do not like their man. Unleashing facts on how Fury steps in arenas on 20,000 seats for his fights, but only attracts 2,000 fans, Chisora said that in thier first match, Fury beat him infront of 4,000 people. Things look to be a lot different this time round as both fighters have already attracted widespread attention. Fury confirms he is the home fighter and remains in his element with all the crowd attention on him. Chisora confirmed he will be in great shape for this fight and has already started training twice a day with trainer Don Charles, confirming he will be leading the pace and picking up the win. Chisora has got himself in great shape and will no doubt refrain from letting himself go any time soon. Fury on the other hand states Chisora will not change from the last time they met, and he will be fighting the same Chisora as last time round, although Peter Fury did offer some words of praise for Chisora, stating he will be more motivated than ever and has stepped in the ring with great opposition since these two last met, however both fighter and trainer did agree regardless of who the opposition is, a loss is a loss. Fury confirms he would have liked a warm up fight before taking this after a long time out the ring, but he knows Klitschko wont hang around the Boxing scene forever and he must move quick if he wants to step in the ring with the champion. Predicting a round 5 ko of Chisora, Fury remains his ever so confident self. At Mexico City (Telemundo): "Boxeo Telemundo"
At Los Angeles (Estrella TV): "LA Fight Club"
At Las Vegas (CBS Sports Net): "Knockout Night at the D"